More than a month after IAF pilot Abhinandan Varthaman’s release from Pakistan, a picture which ruled the internet about a month ago, is viral again. With over 3.1k likes and 638 retweets, this picture was posted on Twitter from Twitter account named Dennis Does Pakistan (@DennisCricket_). The picture shows the front of a restaurant named Chaiiwala. The signboard above the restaurant shows the name of the restaurant and on the left side, there is an animated picture of Abhinandan Varthaman holding a cup of tea. The caption along with the photograph goes like this, “Just dropped in here for some karak chai. The price was one MIG-21 per cup.” ( Translation: Karak chai means strong, well-prepared tea). The context of the image comes from a video featuring Varthaman where he talks positively about the hospitality bestowed upon him by the Pakistani government and the Pakistani army. Upon being asked by the officials about the tea which he was sipping, Varthaman replied by saying that the tea was fantastic. The MIG-21 is an aircraft which Varthaman piloted before it met with the fateful crash thus resulting in Varthaman’s parachute to land over Pakistan. Just dropped in here for some karak chai. The picture was posted at 5:36 PM on 6th April from Melbourne, Australia. The objective or message behind this post remains vague. It is unclear if the caption was a show of appreciation towards Varthaman or just a mellow taunt in guise. But the picture stands out to be just a photo-shopped picture. 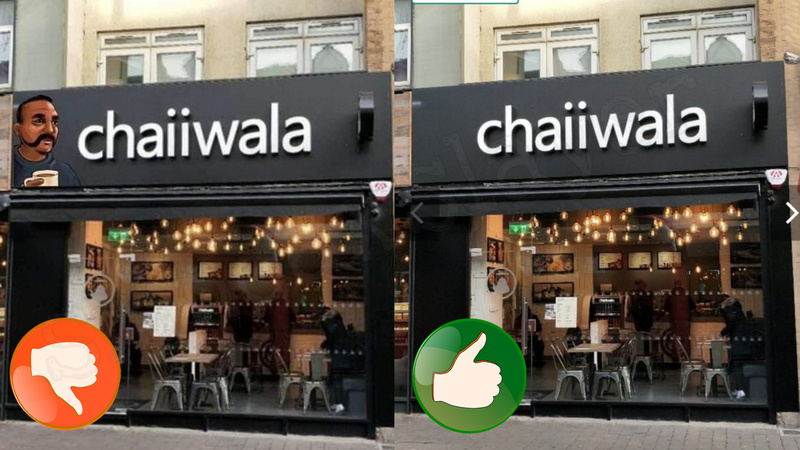 Chaiiwala is actually a restaurant situated in England. And after checking out the pictures of this restaurant it can be justified that the above picture is fake and Varthaman’s face is nowhere placed on the signboard. It has been digitally added next to the name of the restaurant. The truth was obtained by applying the reverse image search by Google, Tineye and Yandex. There’s also a video posted on the Twitter handle of Chaiiwala confirming that there is indeed no picture on the front. ” We have no images on our sign as the internet is showing. Chaiiwala has no involvement in political. Peace and love”, a woman can heard heard saying in the video. The fake picture also went viral sometime back in February and it was debunked by some media organizations, which actually led the Twitter handle of Chaiiwala put out a video explaining that there was indeed no picture on their signboard. ← Fake viral Whats app message is being circulated about how you can cast your vote. Proud of Photoshopped Indian Flag on Israel’s Parliament ? That’s not a Tuticorin video showing protestors attacking cops. June 11, 2018 Hoax Slayer Comments Off on That’s not a Tuticorin video showing protestors attacking cops.